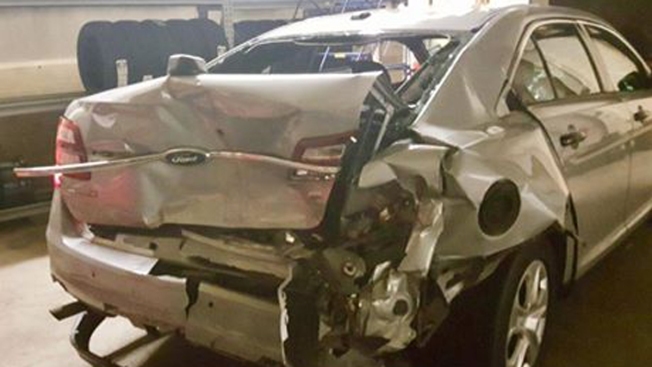 A Connecticut State police cruiser was rear-ended on I-91 early Sunday morning while responding to a different accident. Connecticut State police are reminding drivers to move over after a trooper was injured when his cruiser was rear-ended on Interstate 91 early Sunday morning. Police said Trooper John Acampora had responded to I-91 north near exit 3 in New Haven for an accident involving a car fire. According to police, Acampora was sitting in his cruiser with his emergency lights on when a driver crashed into him from behind. Acampora had to be extricated from the vehicle and was taken to the hospital for treatment of minor injuries, police said. The driver of the vehicle, identified as James A. Graham of New Haven, and his passenger were also taken to the hospital with minor injuries. Police said Graham was uncooperative and combative after the crash and had to be handcuffed to the gurney. Charges are pending against Graham.